While ordering my usual cup of Yippee IA at Elemental Coffee, which never fails to make me think of Die Hard, I noticed a sample basket of spices. Naturally the purveyors wished us coffee drinkers to direct our taste buds towards their new store. Variety, as we all know, is good for the community as much as it is for commerce. Savory Spice Shop is located at 4400 N. Western Ave. It seems right at home on Western with Sushi Neko and The Lobby Bar, among others. Owner Able Blakley said he’d scouted Oklahoma City for months looking for just the right location. At the time there wasn’t an available space in his most desired neighborhood and nowhere else in Oklahoma City appealed to him as much as this section of Western. Then the laundry mat, which had a staggering 20-year lease, decided not to renew it. Within a week Blakley said he’d secured the building for his shop. When you think about it, a laundry mat among niche restaurants does seem out of place, even so, Blakley said Oklahoma City businesses have been welcoming and that a soon-to-open restaurant in the Plaza District, The Mule, has expressed interest in using Savory Spice Shop blends. Blakley intends to make the shop neighborhood-friendly so nearby residents can have a place to leash their dogs outside and even go as far as to provide visiting pooches with treats and water. He’d also like to have a bike rack for his patrons at some point too. The shop officially opens this Sunday September 16th from 12:00-5:00 p.m.
Refraining from making a song pun, but should you be thinking “spice, spice, baby” you would not be alone. OKC.NET: How did you discover the Savory Spice Shop franchise? Blakley: I grew up outside of Enid, Oklahoma and went to the University of Oklahoma. I graduated with 2 business degrees from Price College of Business then moved directly to Denver, well via Chicago, anyway I lived in and around Denver for 6 years. I discovered Savory Spice Shop sometime in the summer of 2005 while at their original store on Platte St. in downtown Denver. I had been looking for a good rib rub. The referral came to me from a butcher, who had rubs in his shop, but he told me that if I wanted the really good stuff to go to Savory Spice Shop on Platte. OKC.NET: Where do the spices come from and how are they harvested: ethically, sustainably, or conventionally? Blakley: We carry somewhere in the neighborhood of 400 different products, roughly 250 of these are individual spices. Our spices come from all over the world. Predominately they are from tropics and spice islands because of the kinds of climate required to grow them. They are sourced from somewhere in the neighborhood of 50 different vendors and the harvesting methods and techniques for each are so drastically different that I really can’t speak for them all. I can say that we do use organic products and products sourced from the USA as much as is possible, but the climate of this entire country is just not really appropriately suited for the harvesting and cultivation of most spice. OKC.NET: What prompted you to open a store in Oklahoma City? Blakley: I love Oklahoma City and I love spices. When I moved back to Oklahoma in December of 2010, I didn’t have anywhere to get the spices that were so readily available back in Denver. Actually, I couldn’t even get the kind of groceries that I was used to in Denver. I remember the first week back. I’d asked a guy in my office where people went to get groceries. Remember I lived on a farm outside of Enid, then in Norman, but never in OKC proper. The guy said, “Wal-Mart I guess,” which was pretty devastating for me to hear as I was used to buying spices from Savory. Not long after, Sunflower Farmers Market, which is now Sprouts, moved in. They are a Colorado company that I had shopped with before. Then Whole Foods followed. So once those players came in and I saw their success, I began thinking OKC was ready and in desperate need of a good spice shop! OKC.NET: What was your background before committing to open the shop? Blakley: I was an insurance claims adjuster for about 4 years, gainfully unemployed for 1.5 years, and then I sold insurance for another 2 years. OKC.NET: How is Savory Spice Shop different than Native Roots or Forward Foods (and possibly other places that offer custom blended spices)? Blakley: Native Roots and Forward Foods are both specialty grocery stores and I absolutely love them both, especially Forward Foods since it’s right up the street from our shop. Truthfully, I have taken several people to Forward Foods after talking to them about my shop. The way we are different is that spice is the only thing we do and we do it VERY well. We don’t sell food. That alone sets us apart quite a bit. We have over 150 proprietary blends of spices. Each is hand-designed by our founders, Mike and Janet Johnston, and ground from whole spices in very small weekly batches that are only blended for us. These custom blends can’t be found in any grocery store, thus Savory Spice Shop is the only place to get them. And what sets us apart from the major chain grocery stores in the area is that our blends contain 100% spice. Most of the conventional grocery store blends will contain fillers, anti-clumping agents, and MSG. When you buy a spice blend at Savory, all you get is fresh ground spice. Also, everything we offer in the store is offered in customer friendly quantities. That means if you only need one table spoon of some random exotic spice, like say Fennel Pollen for a recipe you will only ever make once, you can come into our shop and buy 1 ounce. We will put it in a little zip lock for you, that way there won’t be a jar of it taking up room in your spice rack for the rest of your life. Also people are welcome to smell and taste everything in our store. I haven’t seen many supermarkets doing that in the spice isle. Finally, and maybe most importantly, we offer 40 different gift sets made up of specially chosen spices. We have gift sets from Steak Lovers to Coffee Lovers, additionally there are gourmet salts, popcorn packs, and everything in-between. Each gift set is packaged in a special box that includes whole cinnamon sticks, whole star anise, whole nutmeg and a whole red chile. They’re very attractive and can be given for any occasion. We can also make custom sets to fit peoples specific tastes. 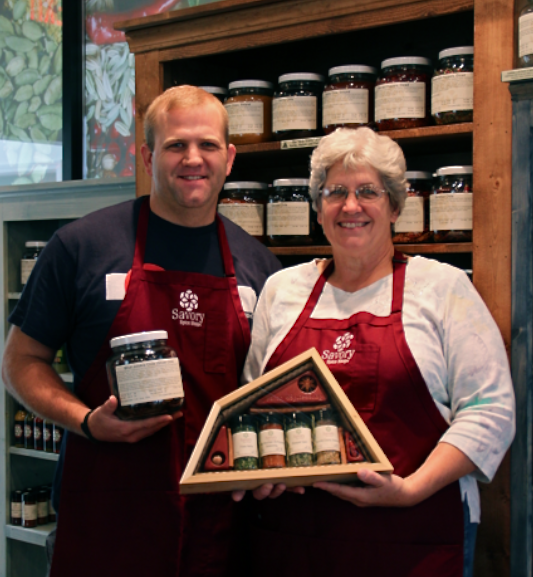 Savory Spice Shop owners Able and Debra Blakley show off the Ghost Chiles and one of their many gift sets. OKC.NET: Who is helping you at the store and how well-informed is the staff? Blakley: I started the shop with my mom, Debra Blakley and we now have a small staff. My mother, two employees, and I spent most of August in Denver doing intensive preparation and product training to be the most well-informed spice merchants we can possibly be. With over 400 products, really, we have to be extremely well-informed. Most people in this area have probably never been into a store anything like ours, so we have worked very hard to train our staff to know as much as possible about everything in the shop. Also we have a team of 3 people in from the Denver headquarters helping us open the store in case we come upon any unexpected challenges. OKC.NET: What are your range of offerings, is it just spices and nothing else, or we talking spice paraphernalia like grinders and such, or are there a few other select items too? Blakley: Spices, herbs, seasonings, seasoning blends, extracts, a few mushrooms, and some whole chiles. We do carry the world’s hottest chile the Bhut Jolokia, or Ghost Chile. We carry those whole, ground, or in a Ghost Chile salt form. We will have a wide assortment of spice grinders and also a few books related to spice. We do offer some stocks, demi glaces, and bouillons. And of course the gift sets. OKC.NET: Will you offer cooking classes or spice education classes? Blakley: We will! We are excited to share our knowledge and love of spices with everyone in OKC. We are already planning a class series on all different sorts of spices. We’ll have some cooking classes, but we are kind of limited in what we can do as we can’t actually cook in the store. OKC.NET: Will you design custom blends that will only be found in Oklahoma? Blakley: I’m so glad you asked! Savory has already come up with two specifically Oklahoma-themed blends. One is called the Panhandle blend. It’s a chicken fried steak seasoning. The other is called the Great Plains blend. It’s a beef and/or bison butcher’s rub. I have had a chance to try them both and they are something I am very proud to carry in the shop as they are AMAZINGLY GOOD!!! Savory has a whole line of regional blends based on the area of the country where we have shops. We are lucky that our store is so large that we will be able to carry all of these blends. OKC.NET: Can anyone bring in their favorite spice recipe and then have you blend and bottle it for them? Blakley: Well, not exactly. If someone has a blend recipe that they really like, what we can do is take a look at it and try our best to match them up with one of our existing blends that most closely represents what they are looking for. If they want exactly what they have written down, we do carry over 250 individual spices. So, we can get them all the necessary ingredients to make the exact blend they want. One problem that we run into when trying to replicate blends is that tons of grocery stores add MSG to their blends as a flavor enhancer. Since we do not do this for a number of different reasons, our blends do tend to taste slightly different. The good thing is, is that we are all well-trained on how to detect MSG in a blend. We can usually tell right off if a blend someone brings in for us to replicate contains MSG. OKC.NET: Will you ever locally source spices? Blakley: Due to Oklahoma’s climate, it would be very hard to source any spices from the state. I do know of some mushroom farms that are getting started here so once those are up and running I will for sure talk to the franchise owners about trying to use some Oklahoma mushrooms. OKC.NET: What haven’t I asked that you feel is important that people know? Blakley: Hmmm…important to know. I just want the entire city to know how excited we are to be here. Having grown up in the state mom and I are both honored to be able to start this business to bring a little new flavor (pun intended) to the city. This is such an exciting time to be living/starting a business in OKC. The city is growing by leaps and bounds and we are just beside ourselves with excitement about the opportunity to be a part of this most exciting time in the city and the state. Also I want to thank the OKC small business community for accepting us with such open arms. Everyone we have come into contact with has been so welcoming and supportive and wonderful. I can’t thank the local business owners enough for the tremendous support that has been shown to a new business coming to the area! OKC: This is just for fun. If you’ve read Frank Hebert’s Dune or watched David Lynch’s Dune what’s you’re favorite line from the book or quote from the movie? If the above question is not applicable, do you have a favorite bad pun about the spice trade? OKC.NET: Naturally story-telling is the oldest profession as you can’t sell anything without a good story. You can follow Savory Spice Shop on Twitter (@SavorySpiceOKC) and Facebook. Tagged chile, community, Debra Blakley, Forward Foods, Ghost Chile, MSG, NET, OKC, oklahoma, Oklahoma City, Savory Spice Shop, Western Ave. Bookmark the permalink.